 Journalist Spooner presents a narrative of the Pinochet regime through profiles of the major government and opposition figures, many of whom she interviewed. Spooner, who lived in Chile during the Pinochet period (1973- 88), is at her best when discussing Chile prior to the 1973 military coup that toppled Socialist President Salvador Allende's government. General Augusto Pinochet comes across as a very limited provincial man entirely unsuited for any political role. The junta, and Pinochet in particular, were perennially suspicious of the United States and naturally quite resentful of the US arms embargo. Spooner notes the ironic fact that, under the junta, Chile was actually less militarily secure because of the embargo and Pinochet's purging of the foreign service. The junta was hurt even more by several public relations campaigns in the US that only further alienated Congress. Spooner is particularly adept at writing about the so-called ``Chicago Boys,'' those young Chilean economists who were trained at the University of Chicago, known for its conservative free-market approach. In one amusing anecdote, Spooner tells how David Rockefeller, visiting Santiago, praised the Chicago Boys. When asked what advice he would offer workers whose earnings were devoured by inflation, the millionaire suggested they elect officials to improve the economy, ``as the Americans had done in voting for Ronald Reagan.'' Rockefeller had put his foot in his mouth--there were no free elections in Chile. Although the Reagan administration lifted some sanctions (but not the arms embargo), relations were still more sour than sweet between Santiago and Washington during the 1980s, long before Pinochet lost a plebiscite in 1988. Spooner writes about an important subject, but her style is often repetitive. 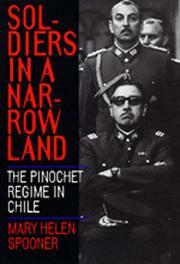 Yet the book has merit largely because it graphically details the dismemberment of the democratic process in Chile.